As a vegetarian, I always find Christmas a difficult time food-wise. When I think of traditional Christmas foods I inevitably think of things like turkey, goose, pigs in blankets, potatoes roast in goose fat. And if you’re vegan it’s not any easier as traditional festive treats include brandy butter, cheese boards and other such dairy treats. When I try to think of traditional vegetarian and vegan Christmas foods my mind goes blank apart from Brussels sprouts, cranberry sauce and nut roast. What I always say is that if you are having a vegetarian or vegan Christmas too, then the number one rule for happiness is to rip up the rule book! You don’t have to have nut roast because someone in the seventies decided that’s what vegetarians and vegans should eat (I’ve never had a nice one). Just because Brussels sprouts are the done thing at Christmas doesn’t mean your whole meal has to revolve around them. Cook what makes you and your family happy. It doesn’t matter if it’s particularly Christmassy because you can make it a family tradition that your family associate with Christmas year on year. Which brings me to the question – what food makes my family happy? And that, my friend, is a very good question. My partner and I have been vegetarian for 11 years, and our Christmas main meal has mostly revolved around Quorn Roast, which we first started eating out of convenience and which then grew into tradition. The trouble is it isn’t dairy free, which poses a problem as my youngest daughter was just this year diagnosed with a dairy intolerance so our beloved Quorn Roast is out this year. I’m still not 100% certain what we will cook for the main course, but I have at least settled on the starter. 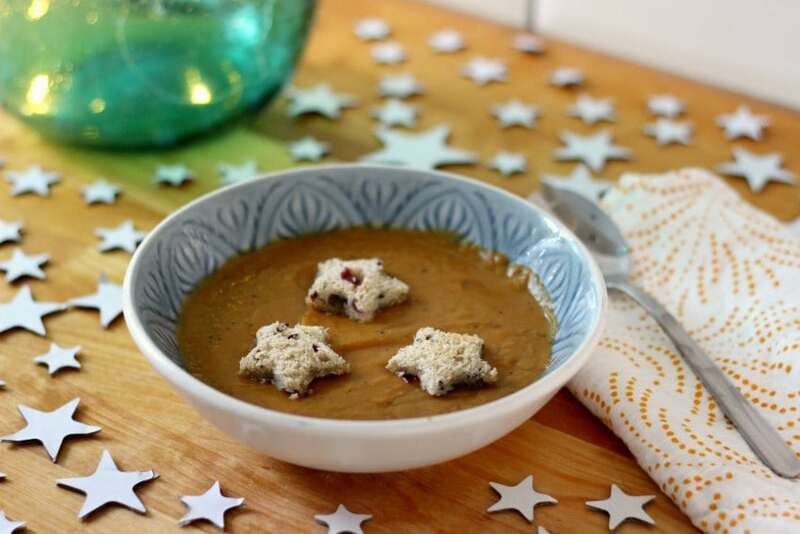 As it’s our first Christmas going down a vegan route I am steering completely away from tradition and will be serving up this organic sweet potato, chili and coconut soup. 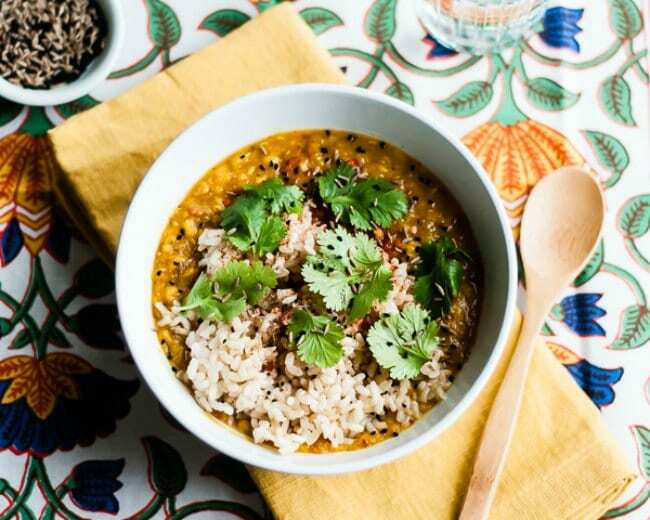 It’s tasty, comforting, vegetarian, vegan, slightly spicy (everyone in my family, especially my kids, loves spice), and is quick and easy to make. Basically, it makes each and every one of us happy – and that’s what Christmas is all about! Organic food makes us especially happy as the journey from field to fork is less damaging to the environment and to the growers and pickers. It’s a healthier choice all round, and it’s why I’ve partnered with the Organic. 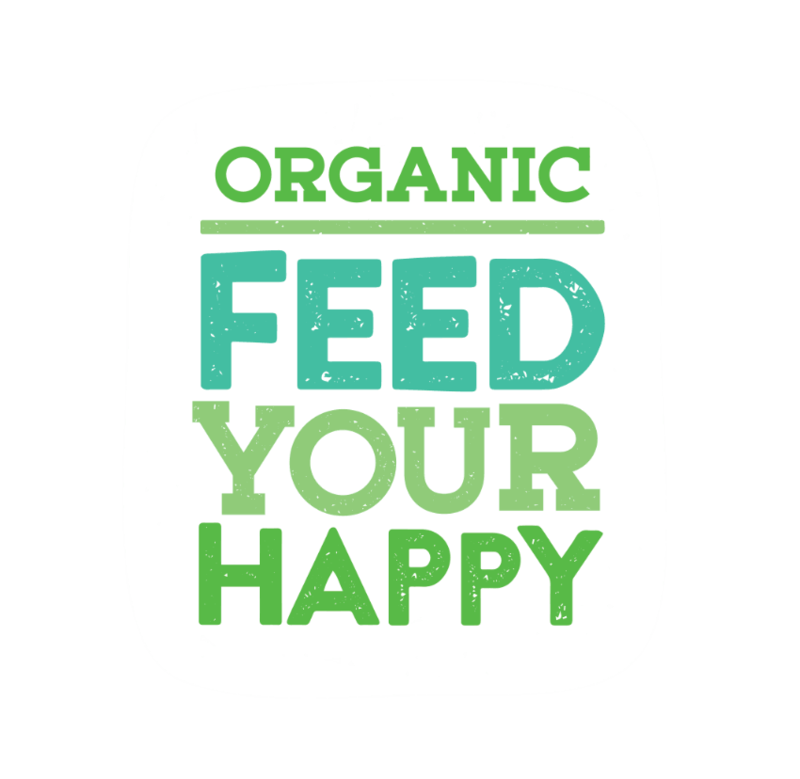 Feed Your Happy campaign, a campaign ran by the Organic Trade Board, in order to raise awareness of the joy of organic food. I adapted this recipe from one I found on Bearded Baker. It was a little spicier than my family’s palate allows for, so I’ve toned down the chili, brought in some additional flavours for extra depth, and reduced the amount of sweet potato for a less thick soup. And of course, I’ve made it organic, which adds that extra bit of happy to the dish! Make this delicious vegan and vegetarian friendly organic sweet potato, chili, and coconut soup with easy recipe. Add the oil to a medium sized soup pot and heat gently. Once heated add the onion, and cook over a medium heat until translucent. Once the onions are translucent, add the chili, ginger and garlic to the pot, and heat for two minutes. Then add the sweet potato, the vegetable stock and paprika. Bring to the boil and then let the soup gently simmer for 15 minutes or so until the sweet potato has completely softened. 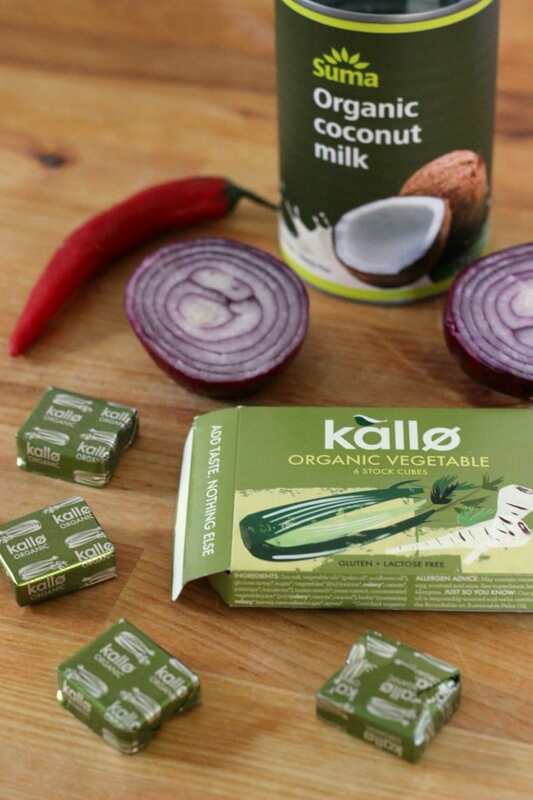 Now add the coconut milk. Don't worry if some of it has solidified in the can - this will soon melt in the soup. Heat for a further 2 minutes, then remove from the pot from the heat and allow to cool for 5 minutes. And if you are looking for one central place to find organic Christmas ingredients or gifts for the family, then why not pop over to the Soil Association’s Christmas Marketplace? 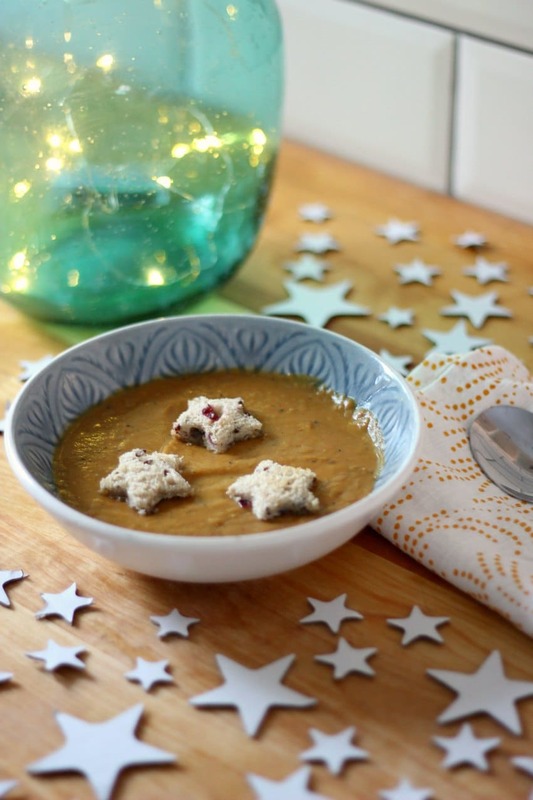 ps: I have more vegetarian and vegan Christmas dinner ideas right this way! I mentioned the other week that I’ve been considering buying a slow cooker (this £25 one*). And then I wondered just how much use I would get out of it, because I’m vegetarian and the majority of slow cooker recipes I seem to have come across have been meat based. So I’ve been doing a little research to see if I can find any vegan and vegetarian slow cooker recipes, and I feel like I hit the jackpot. I found so many great looking vegan and vegetarian slow cooker recipes that I thought it would be useful to share them all here with you, in case you have a slow cooker or are considering buying one. Here are 25 vegan and vegetarian slow cooker recipes (after the jump) that will keep you going all autumn and winter! I plan on trying each and every one of them!